However, I’m not thinking of “apocalypse” in the biblical sense; or in the nuclear-annihilation sense. Typewriters were as significant in the lives of my generation as computers and cell phones are today. 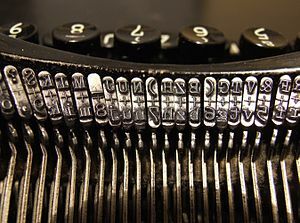 For the beginning of the story about typewriters, see Me And The Blog. Hurray! In some ways, my siblings and cousins are more versatile, more adaptable, than the smarty-pants younger generation. We can drive a stick shift! How many 25-y-o computer geniuses can do that? Huh? I double dare computer geeks to get into a car with a manual transmission and drive it around the block. (Please do not try this at home if small children live in the neighborhood.) I believe a 25-y-o could probably figure out how to use a rotary phone, if locked in a room with one for 24 hours. When I went to work at Congressional Information Service, Inc., in 1977, we had excellent modern IBMs. 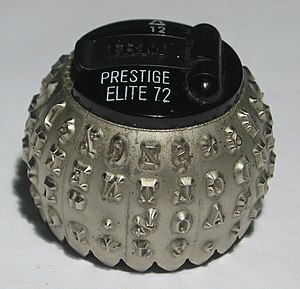 Then we upgraded to the ultimate, the IBM Selectric. And then (drumroll please), the entire office computerized! They dragged me kicking and screaming away from my typewriter and FORCED me to type on a computer. We used a word processing program called Wordstar! You can forget about Wordstar. It will not be on the test. You will never hear about Wordstar again! (Backstory: Before computers, reporters typed news stories on strips of newsprint. A copyboy fetched the story, “take” by “take,” and delivered it to an editor, who scratched it up without mercy and added a headline. The editor rolled the “take” up and tossed it into a square duct, whence it fell by gravity — talk about primitive technology — to the composing room to be set in “hot type” by printers. Now you know why the composing room was always at least one floor below the newsroom. Some newspapers also used “pneumatic tubes.” Pneumatic tubes will not be on the test. With pagination, the entire newspaper page was built in the newsroom by editors or page designers using a computer program such as Quark. I supervised conversion of the copy desk at one small newspaper to pagination using Quark; and was a bit player in conversion of a larger newspaper to pagination using Harris software. 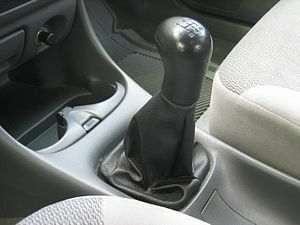 That about covers the history of the world from typewriters to pagination, and from manual transmission to hybrid cars. In an emergency, my generation will always be able to drive a stick shift or dial a rotary phone. Of course, when the real emergency comes, I wonder how many of us will remember how to grow our own food? Or cook? Or make a fire? I will be among the first to starve or freeze. Let’s not think about that anymore. Instead, I’m going to think about acquiring a standard typewriter and a Volkswagen Microbus, and driving off into the sunrise. Mac or Windows? Drawing the Line on Frugality. I can compromise on cola, for the sake of frugality, but you gotta take a stand on principle somewhere. I think I’ll draw my line at computers and operating systems. Two years ago, I paid twice the price for my Mac iBook from Apple, compared to a generic Windows laptop. Never regretted it. Would do it again (not that I can afford a new computer right now). The point is, I don’t NEED a new computer. Apple keeps sending me free software updates over the Net. If I had bought the Windows laptop two years ago, that balky version of Windows would be obsolete, and I’d be faced with buying the new Windows or a new computer. My brand loyalty to Apple is stronger than ever. I’m determined to hold out for an iPhone, or at least an iPod, when I can afford it. Right now, Apple is still coming out with significant improvements to the iPhone on a regular basis, and reducing the price as well. So I’m content to wait another year or two until the iPhone is fully evolved, and the price is lower. Waiting to make an important purchase is a good approach to frugality. Paying more for a product that won’t be obsolete in six months can be thrifty in the long run. Immediate gratification is over-rated.